Becoming successful in our lives is not about struggles or working hard or money. Making money is not about making money. It's not about what we want; it's about why we are not achieving what we want. It's about spiritual awareness. Its about re-remembering who we really are! The blocks that are stopping us all lie in our own minds and through the study and understanding of Metaphysics we can become great happy and powerfully fulfilled manifesters. Yes, we can be rich, healthy and happy. It is deep and yet all so beautiful and simple! It's not even about abilities or talents. Many talented people with fantastic abilities are always broke. 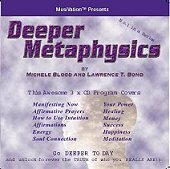 Becoming successful and truly fulfilled is understanding Deeper Metaphysics This program when truly followed and listened to from an open mind will help you find the joy and awareness to be on purpose with your life.